The American West has a long tradition of conflict over water. But after fifteen years of drought across the region, it is no longer simply conflict: it is crisis. In the face of unprecedented declines in reservoir storage and groundwater reserves throughout the West, Shopping for Water focuses on a set of policies that could contribute to a lasting solution: using market forces to facilitate the movement of water resources and to mitigate the risk of water shortages. 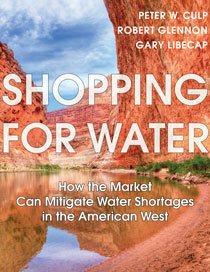 Shopping for Water begins by reviewing key dimensions of this problem: the challenges of population and economic growth, the environmental stresses from overuse of common water resources, the risk of increasing water-supply volatility, and the historical disjunction that has developed between and among rural and urban water users regarding the amount we consume and the price we pay for water. The authors then turn to five proposals to encourage the broader establishment and use of market institutions to encourage reallocation of water resources and to provide new tools for risk mitigation. Each of the five proposals offers a means of building resilience into our water management systems. Get the free ePub here. Get the free Amazon Mobi here.